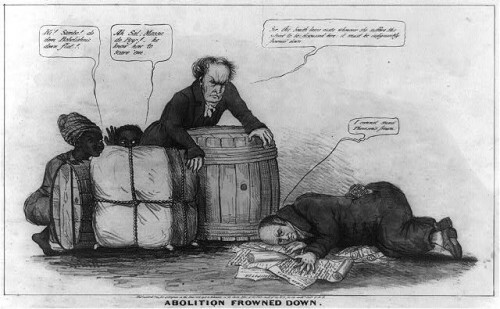 This political cartoon satirizes the enforcement of the “gag-rule” in the House of Representatives, which prohibited discussion of the question of slavery during much of the antebellum era. In the 1830s, growing antislavery sentiments of northern representatives clashed with resentful southern congressmen who saw the discussion of slavery as meddlesome and insulting to their constituencies. This print may relate to John Quincy Adams’s opposition to passage of the resolution in 1838, or (more likely) to his continued frustration in attempting to force the slavery issue to debate through the presentation of northern constituents’ petitions in 1839. In December 1839 a new “gag rule” was passed by the House forbidding debate, reading, printing of, or even reference to any petition on the subject of abolition.